Our Chief Executive, Barry White, joined local civic and business leaders yesterday for a local launch of the Strategic Transport Plan. 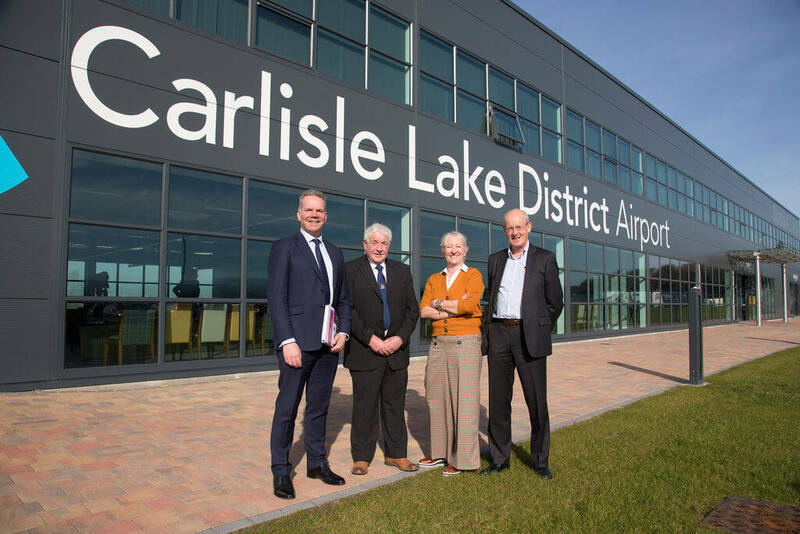 Following a pan-Northern launch in early February, the event at Carlisle Lake District Airport provided an opportunity to engage with local leaders and outline how the plans will deliver transformed connectivity for Cumbria. The event follows a momentous few weeks for the North, as the Transport for the North board approved the Strategic Transport Plan and the high-level business case for Northern Powerhouse Rail. The Strategic Transport Plan outlines how a £70 billion pipeline of investment would transform connectivity across the North and unlock £100 billion additional GVA and support the creation of up to 850,000 new jobs. The Investment Programme, which accompanies the Strategic Transport Plan, contains transport interventions that would transform connectivity across Cumbria and the rest of the North. Potential interventions in Cumbria include improvements to the A69, A689 and A595 including the Whitehaven Relief Road, the upgrade of the A590 together with the dualling of A66 between A1(M) and M6 and a new link to the north of Kendal. Also included are upgrades to the Furness, Lakes, Cumbrian Coast and Tyne Valley Lines. The plan also seeks to ensure that Cumbria achieves the most out of HS2 with station improvements and increased capacity proposed along the West Coast Mainline and at Carlisle, Penrith and Oxenholme. Also included is the Carlisle Southern Link Road, which is to receive £102m funding from Central Government, announced just a few days after the Investment Programme was formally endorsed by the Transport for the North Board. Barry White, Chief Executive at Transport for the North, said: “In addition to being a well-loved visitor destination, Cumbria is also home to world class defence, energy and advanced manufacturing industries. The area is an integral part of our Energy Coasts corridor and the transport interventions outlined in our Investment Programme will transform connectivity and unlock opportunity both within Cumbria, and across the North. “For the people of Cumbria, the Strategic Transport Plan will mean they have more choice over where to live and work, access to higher quality jobs and better connections to friends and family. It will give local businesses more opportunities to collaborate, trade and grow. Cllr Keith Little, Cumbria County Council Cabinet Member for Highways and Transport, said: “We have been proactive in pushing for Cumbria to be well represented within Transport for the North’s Strategic Transport Plan (STP) and are pleased to see that our views have been listened to. Dr Steve Curl, Cumbria LEP board member, said: “We are working with Transport for the North on behalf of Cumbria to maximise potential benefits for the county and the publication of the Strategic Transport Plan is another important step forward. For example, we have worked with TfN to secure support for improvements to the A595 at Grizebeck, as well as to develop the business case for the Cumbrian Coast Line. “Cumbria features in strategic ‘corridors’ identified in the plan which highlights the county’s transport priorities for investment. These corridors link key economic centres across the North to help support business growth, productivity and job creation. To find out more about the Strategic Transport Plan and the Investment Programme, click here.